Most Thursday mornings start the same way for Seth Jacobson, the editor in charge of The Times of London Weekly, a new app aimed at readers outside the U.K. The app is released each Thursday, so that morning Jacobson begins reading through everything that’s published in that day’s paper and emails himself the most interesting stories. That begins the process of choosing the 90 or so stories from The Times and Sunday Times that will populate the next issue. The app debuted last month in 46 countries. It’s only available on iOS for now but will eventually expand to Android as well. A subscription is $3.99 per month after a month-long free trial. The weekly app is an interesting addition to The Times’ core business model, and the paper’s digital staff plans to use some of the back-end tools it’s developing for the app for other projects down the line. The Times of London, which is owned by Rupert Murdoch’s News Corp, has a hard paywall. The Times makes it practically impossible to read its journalism for free. Readers have to sign in if they want to access stories from the papers’ homepage or social media feeds. The Times has 170,000 digital-only subscribers, and in 2014 it posted its first profit in more than a decade. Petrie wouldn’t share how many people have subscribed to the weekly international edition, but The Times expects business and sports stories to be especially popular since London is a global financial center and thePremier League has a worldwide following. The app fits in with The Times’ strategy of focusing on finite, finish-able products, from a daily tablet app to its website. It’s a challenge to pick stories that will remain relevant up to a week after they were first published. It’s also potentially difficult to keep up with the news cycle: When David Bowie died earlier this month on a Monday, much of The Times’ more in-depth coverage was published in the following Sunday’s paper, which was too late to make that week’s Weekly edition. The Times might eventually write original stories for the weekly app. For fast-moving stories, like the presidential primaries, it might do a write-through that ties multiple stories together. It’s planning to add video and other visual elements, too. For now, though, the process begins with those emails that Jacobson begins sending himself on Thursday mornings. The stories then have to be copied and pasted into the editor that The Times built for the app. The editor was built on WordPress and has two main sections. The first is a dashboard that shows how many stories have been added and the time until the app’s deadline. The other half of the tool is where each edition of the app is actually built. When editors add headlines, body text, and photos, the software mimics what users will ultimately see in the app or on the web, where users can share stories that can be accessed for free. “We’ve attempted to model this visually as close to the app as possible, so you literally feel like you’re building the real edition,” Chris Hutchinson, The Times developer who built the editor said. Within the next few weeks, The Times plans to introduce a more automated system that will pull from the paper’s recently launched content API and autofill everything into the editor, Hutchinson said. He plans to create a Google Chrome extension that will let editors automatically import a story’s details into the editor, along with notes about why they picked a story, and changes they’d like to make. The Times also publishes on Apple News (it’s actually one of the few places where you can read its stories for free). Hutchinson said that as the weekly app’s processes are automated, he plans to merge the feed used to power Apple News with the one that provides stories for the app. Editors will still be able to alter headlines, add in new images, or change any other details to suit the articles for the app. 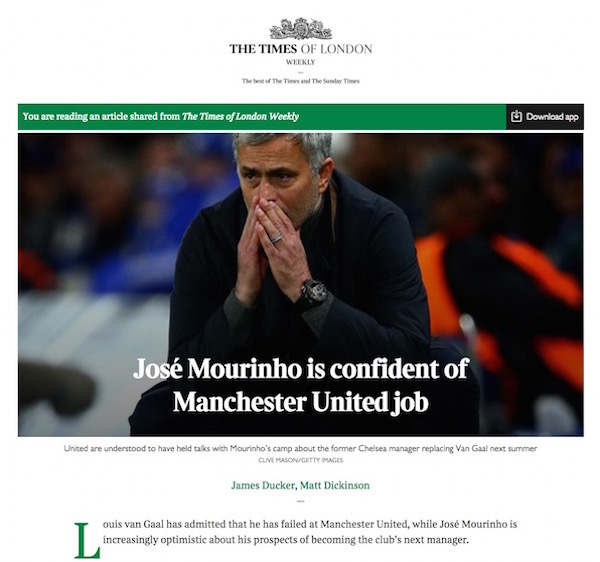 The Times also plans to use the editor for other projects, and it wants to maintain the ability to create articles from scratch if necessary. “It’s really important for us to be able to tailor the article to the particular platform,” Hutchinson said. The Times’ developers also think about ease of use for staff. Last year, for example, they developed a series of tools to make it easier for journalists to create things such as newsletters, charts, and social media cards. That’s the approach The Times took with the editor tool for the weekly app as well. As the paper continues to experiment with new formats — new proprietary apps, Apple News, Facebook Instant Articles, or whatever social platform is next — the developers want the paper’s decisions to be made on the merits of the journalism itself and whether it’s the right way to reach readers.